Follow these steps to integrate Tenjin Attribution Tracking in to your game. Tenjin attribution is a server based service that sends attribution data on your players to deltaDNA from the Tenjin servers. 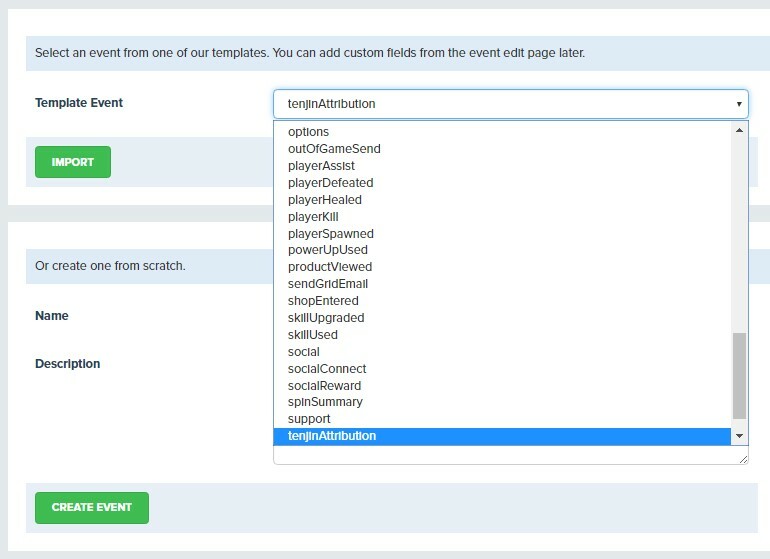 1) Add the tenjinAttribution event to your game by selecting the event from the Template Events list on the Create Event page that is accessible from the SETUP->TOOLS-EVENTS navigation menu in your development environment. You can also reach the Event Creation page by clicking on the Create Event button at the top of the Event Management page in your DEV environment. 2) Instrument your game client to populate the deltaDNA userID parameter with the contents of the Apple Advertising ID if it is available and non zero. If the advertising ID is not available the deltaDNA SDK should be started without a userID, this will ensure that the SDK generates an anonymous userID for the player. If the advertising ID is available it should be provided as the userID when the deltaDNA SDK is started for the first time. Tenjin uses the Apple Advertising Identifier to track players but they do not have a mechanism to associate an anonymous deltaDNA userID to the player, you must therefore use the Advertising Identifier value, if available, as the userID in deltaDNA in order for the Tenjin attribution data to be associated to the correct player. 3) Setup the attribution post back on Tenjin. Your Tenjin account manager will be able to create a POSTBACK to notify deltaDNA of player attribution data. Where <YOUR LIVE ENVIRONMENT KEY> is the environment key for your LIVE environment, which can be found on the Game Details page for your game. This can be reached by clicking on your game’s name in the breadcrumbs at the top of the deltaDNA portal. The deltaDNA listener can accept either GET or POSTs from the Tenjin postback, the latter is preferred. The Tenjin attribution parameters that are sent to deltaDNA will appear in your data under the tenjinAttribution event with their parameter names prefixed with tj e.g. tjTenjinCampaignId. They will also be applied to the user records as user metrics. The acquisitionChannel is the field used in the measure chart filters and is derived from the ad_network provided by Tenjin.